Ofir Hason Co-Founded Cybergym in 2013, and currently serves as the company’s CEO. He brings over 15 years of hands-on experience in the development and characterization of complex applications, products and critical networks. 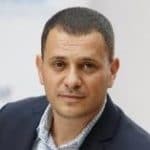 Previously, he served for 7 years as a Senior Manager in Israel's National Information Security Authority (NISA/ISA), and managed several high-profile international research and technological projects. Has won several awards including appreciation awards from the IDF, the U.S Department of Defense (DOD), and the Israeli Electric Corporation (IEC), and is a graduate of the Israeli Defense Forces’ prestigious Intelligence Corps unit (8200). Mr. Hason holds a Masters' Degree in Information Systems from Ruppin Academic College, Israel and an M.B.A. in Management Information Systems, Netanya Academic College, Israel. Google has a vision for users to not have to think about cybersecurity, even as the human factor is the weakest link. Realistic cybersecurity training is still critical as we can't fully trust and rely on technological capabilities.